Late last month Teleread introduced us to BookDrop, a nifty tool that let you automatically convert ebooks in your Dropbox account and send them to your Kindle account simply by putting the files in a certain folder. It is a nifty tool, but it only works with Dropbox. If you have another cloud storage service it's no good for you, and that got me looking for an alternate solution. 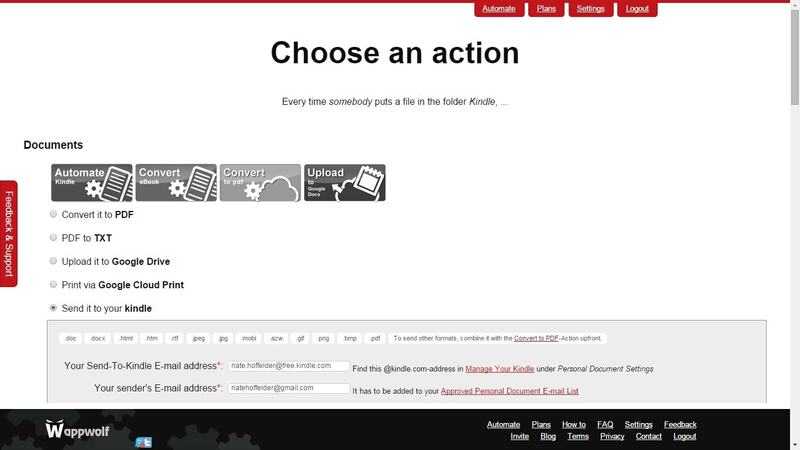 You could of course use IFTTT to send ebooks from Dropbox, Box, or another cloud storage service to your Kindle (IFTTT can also send articles from Feedly, Pocket, etc). I don't plan to use it (I prefer to stick with IFTTT) but I do see that it works equally well with Google Drive and with Box. Sidenote: I would caution you against using this service with gDrive; the first step is to give Wappwolf complete access to your Google account. That is a little much for me. I've been playing with Wappwolf today. While it looks very different from IFTTT, you can see in the screenshot from the way that it is set up that Wappwolf works on a very similar manner. Add a file to a specific folder, and Wappwolf will automatically convert it, forward it, or what have you. There's a few dozen other options off the bottom of the screen, too. Wappwolf looks useful. It might be best to describe it as a direct competitor to IFTTT, one which is focused on working with cloud storage services. But I won't be using it. In fact, I've already deleted my account. Wappwolf is primarily a paid service. There is a free tier, but I can't tell what the limitations are. And since I already have IFTTT set up the way I like, I don't have a reason to try its competitor. But Wappwolf Automator might work for you, especially if you need to automate your cloud storage. If there's a trick that you need that IFTTT can't provide, you should look at Wappwolf. Have you tried Wappwolf? Do you use it?